Over the last year or so, I've been struggling to redefine my views on foreign policy. As a former neo-conservative, I enthusiastically embraced the invasion of Iraq in 2003. I readily accepted the notion that military force serves as a legitimate tool for nation-building. And I still get goosebumps seeing projections of military power. I love fighter jets, tanks and big guns. Maybe that's just a guy thing. But it doesn't take a doctorate in foreign relations to understand that U.S. policy has forged a tangled mess of contradictory alliances and obligations, and created a much more dangerous world. I've gradually come to accept that military intervention in foreign affairs typically causes more damage than good and that the whole concept rests on morally dubious grounds. Who am I to point a gun at another man's head and demand he practice "democracy"? This does not make me a pacifist. I believe in a vigorous defense. If attacked, respond with overwhelming force. As I tell my kids, avoid a fight if at all possible by every means at your disposal. But if you get forced into a position where you have to fight, fight to win. This does not make me an isolationist. Non-intervention differs greatly from closing yourself inside a box and avoiding interaction with the world around you. I favor vigorous and open trade. This stands in direct contradiction to the concept of isolationism. During the 2008 presidential campaign, I bought into the conventional wisdom on Ron Paul. He was pretty good on domestic policy, but a "nut-job" when it comes to foreign policy. But as I've really listened to what he says, as opposed to the media spin, and studied the world I live in today, I find he makes much more sense. Do I agree with him 100 percent? No. But I can no longer simply discount his foreign policy as quackery. I hear this mantra all the time today. "I like that Ron Paul feller, except for his foreign policy." I'm not even sure many who say that really understand his foreign policy positions. 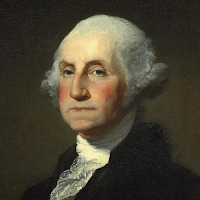 In fact, they line up pretty closely with stated positions of another president revered by most Americans - George Washington. I wonder if Washington could get any traction in American politics today with this kind of foreign policy thinking? The following comes from his Farewell Address, delivered on Sept. 17, 1796. Observe good faith and justice towards all nations; cultivate peace and harmony with all. Religion and morality enjoin this conduct; and can it be, that good policy does not equally enjoin it? It will be worthy of a free, enlightened, and at no distant period, a great nation, to give to mankind the magnanimous and too novel example of a people always guided by an exalted justice and benevolence. Who can doubt that, in the course of time and things, the fruits of such a plan would richly repay any temporary advantages which might be lost by a steady adherence to it ? Can it be that Providence has not connected the permanent felicity of a nation with its virtue ? The experiment, at least, is recommended by every sentiment which ennobles human nature. Alas! is it rendered impossible by its vices? It is our true policy to steer clear of permanent alliances with any portion of the foreign world; so far, I mean,as we are now at liberty to do it; for let me not be understood as capable of patronizing infidelity to existing engagements. I hold the maxim no less applicable to public than to private affairs, that honesty is always the best policy. I repeat it, therefore, let those engagements be observed in their genuine sense. But, in my opinion, it is unnecessary and would be unwise to extend them. I think we would be wise to head his words. He makes temporary allowances for emergencies (such as World Wars) but not to be permanently entangled with other countries. We have done everything he said not to do and we're paying the price to this day.